If you have a multi-location business, then time is of the essence. Marketing efforts should always be leveraged to work across every unit for cost and time efficiency, and to ensure brand alignment. When it comes to online brand presence, you are probably well aware of the importance of Google My Business as a means to improve your online exposure, ranking, and the ability for your customers to engage with your business using Google tools such as Maps, Knowledge Panel click-to-dial and Google Search. Google My Business is a key element of your social and review strategy, but setting your account up can be time-consuming in order to get it right. Before you sit down and try to tackle each location one by one, we want to spend a little time sharing with you the features of a not-so-well-known tool available to multi-location businesses. This tool is an absolute time-saver, and it is super simple to use. Let’s take a look at some of the highlights of this tool and the details on how to use it. 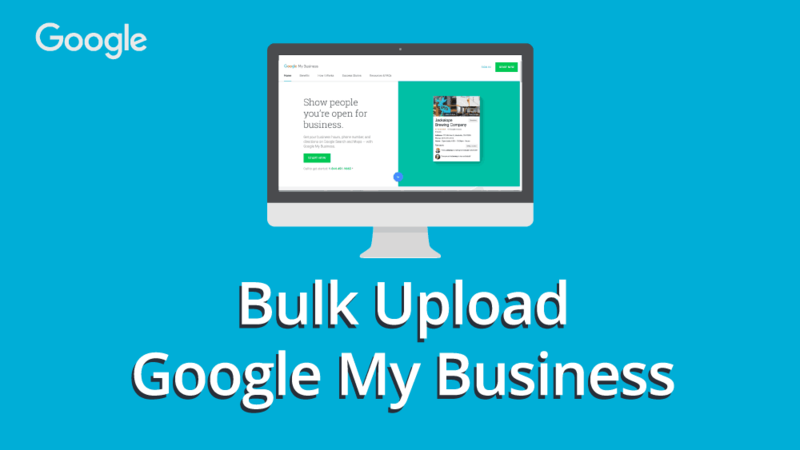 Who Can Benefit from the Bulk Location Management Tool from Google My Business? Google My Business bulk location management tool is designed to be used by businesses that have 10 or more locations under the same brand. Note that this is not a tool designed for bulk upload of diverse businesses managed by a centralized marketing organization. All businesses loaded using this tool must be part of a chain under the same brand name. If you have 10 locations or more under the same brand, then you can head to your Google My Business Locations page. The business must make in-person contact with customers during its stated hours. The business must be open to the public. You may not enter locations that are under construction or not yet opened. You must be the owner of the business or an authorized marketing representative. Your listing name must match your real name, as represented by your offline marketing material, such as signage, etc. All locations must have the same name unless the business’s real-world representation consistently varies from location to location. All locations must also have the same category if they provide the same service. While you can use your regular Gmail account to get this process started, we highly recommend that you create a new account using an email that reflects the domain of the businesses to be uploaded. Using the business domain will reduce the time and steps required to complete the Google verification process. To create your sheet for bulk loading, you will need to download this spreadsheet to your local drive. On your user interface for Google My Business, you will see an option to import locations from a file. Use this option to upload your spreadsheet. Once you have uploaded the spreadsheet containing the data for all your locations, you will be able to check for errors and make changes to individual line items. You can find Google’s comprehensive guide of potential errors and how to fix them on this support page. Now that you have uploaded your locations and made corrections to all the errors and alerts, you may click on the right of your dashboard and request bulk verification. Assuming your spreadsheet had accurate, verifiable data, and you have made corrections to all the listed errors, your businesses will likely receive bulk verification within a week or two. You will need to provide Google with a contact name, official email, phone number, business name, business countries, and the name of your authorized Google representative, if you have one. Once your locations have been verified, you can add more locations, either manually for single locations or via a second spreadsheet. Keep in mind that Google will merge duplicates to ensure there is only one listing per location. Consistency across locations can be of significant importance in ensuring brand alignment, and making certain your customers find you when conducting online searches by category or by business name. If you have multiple locations that were manually loaded, then take time to verify consistency in content, and quality and accuracy on location-specific details such as address, contact info, and hours of operation. Finally, if you have multiple locations with respective Google business profiles, then make sure the reviews you are receiving are accurate for each location, and take the time to respond to reviews and questions posted on your page. Consistent online engagement will give you a competitive edge and help you grow your online reputation for all locations. Google My Business is your one piece of the puzzle. We are ready to help you see the whole picture while you track and centralize customer opinion in a business-conducive way that makes sense for your organization, regardless of size. Is every location (address) verified with a pin? Or can it be verified with just one pin?